Biggin Hall has a restaurant with a great reputation. 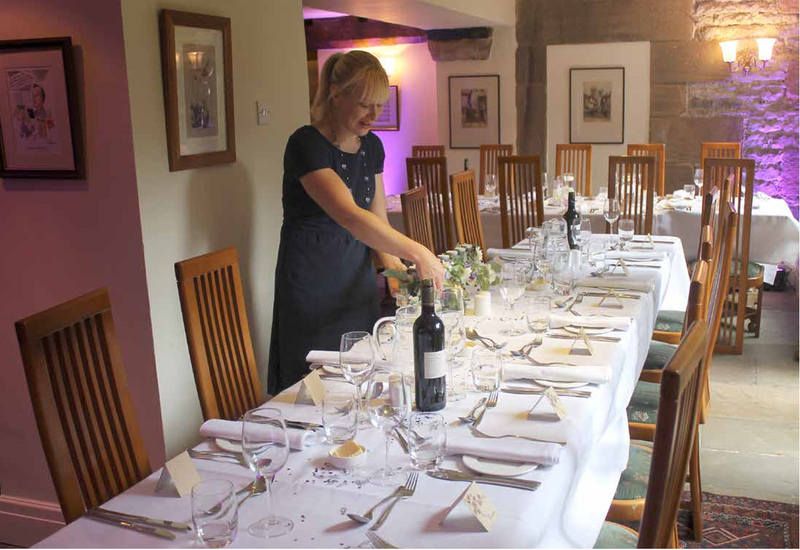 We can confidently handle your wedding day catering with the best quality food and drink, to take the headache out of organising your big day. You are welcome to choose from our sample menus or our chef will discuss your favourite dishes and create a bespoke menu using fresh seasonal ingredients. We provide a wide range of drinks and are a fully licensed venue. We are happy to discuss our wine list with you, and our wine supplier can make suggestions about wines that would complement your menu. We suggest that your guests are welcomed with a light sparkling drink on arrival and you can then choose from our extensive wine list. If you wish to bring your own wine or champagne we make a corkage charge of £12 a bottle. Table layouts can be discussed in detail with our Operations Manager – we have various table plans to suit most weddings but will of course tailor the room exactly to your requirements. Floral arrangements are a great way of decorating the Hall but fixings may not be put into the walls,arches or fabric of the building without our specific permission and guests need to respect that the building is a Grade II* listed building. No picking or use of any of the flowers or greenery on our property including our drive is allowed either please! Guests may also hire a marquee to use in our grounds as part of the hire, and so please talk to us about how you would like to shape your special day and we can see what we can accommodate. To book a tour of the hotel and grounds, please phone us on 01298 84451 and ask for our Operations Manager who will be happy to discuss your wedding day in more detail. Find out how Biggin Hall could be the perfect venue for your perfect day.